Ken showed me the ECG below on Friday. It shows complete heart block with a wide QRS (RBBB, LAFB). There is an ectopic (VE) with LBBB. What concerned him was the P wave (blue dot) which conducted normally to the ventricle. How do we explain this? The supernormal phase of AV conduction was first described in the 1930’s as commencing on the descending limb of the T wave until the onset of the u wave. It is a short period of enhanced conduction, which was defined by Pick et al in 1962 with clear case studies, one of which is shown below!! Later it was shown with asynchronous (VOO) cardiac pacing. At least this ECG is clear. The top panel shows complete heart block and normal AV conduction when the P wave occurs immediately after the T wave. The bottom panel shows asynchronous ventricular pacing (VOO) with normal AV conduction if the P wave falls this time in the T wave of the paced beat. When this occurs, the next pacing stimulus artefact may occur in the ventricular refractory period and there is exit block. 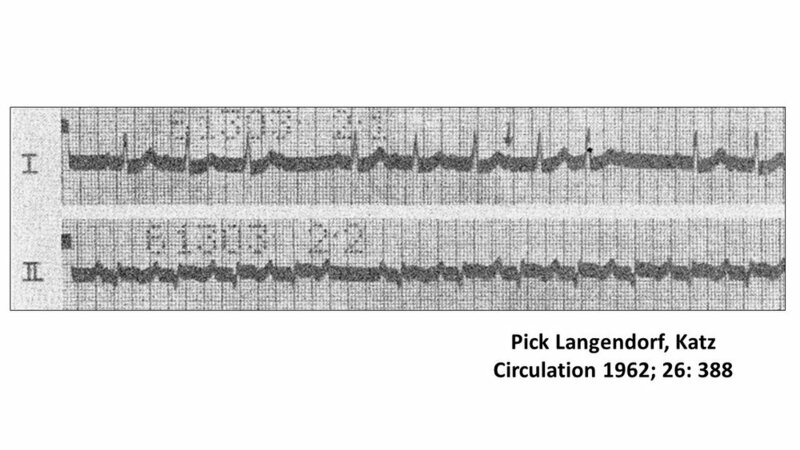 I also reported this it in the 1970’s with ventricular pacing and high threshold exit block. The asynchronous ventricular pacing (VOO) with non-capture (arrows) is competing with the underlying native rhythm (red dots). When the stimulus artefact falls on the T wave of the spontaneous T wave, ventricular capture occurs.